While many prints depict the famous Monkey Bridge from a distance, Hiratsuka reveals the clever cantilevered design of the bridge’s underside close-up. Inspired by the image of monkeys holding hands to cross the river, the wooden Monkey Bridge is a 1,300-year-old architectural feat that spans two high cliffs flanking the Katsura River in Yamanashi prefecture in central Japan. 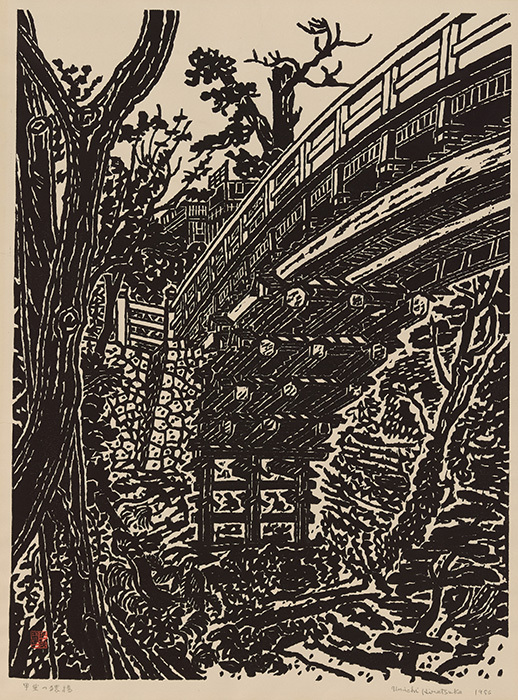 Monkey Bridge displays Hiratsuka’s well-known style—powerful, jagged lines—that suggests the revered landmark’s strength. Hiratsuka preferred black and white, which he argued were more beautiful than colors, and appreciated both their bold contrast and the solitary strength of black ink. 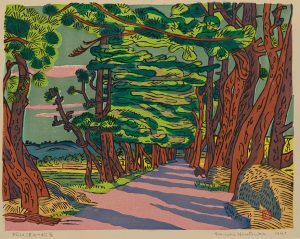 Evident in this print is Hiratsuka’s technique of tsuki-bori (literally called “poking carving”), which employed a square-tip tool rocked from side to side to create a jagged line. Hiratsuka, who is better known for black-and-white prints, rendered his hometown Matsue in a warm array of colors. In this early work he used v-shaped knives to carve smooth, fine lines that precisely delineate the landscape. 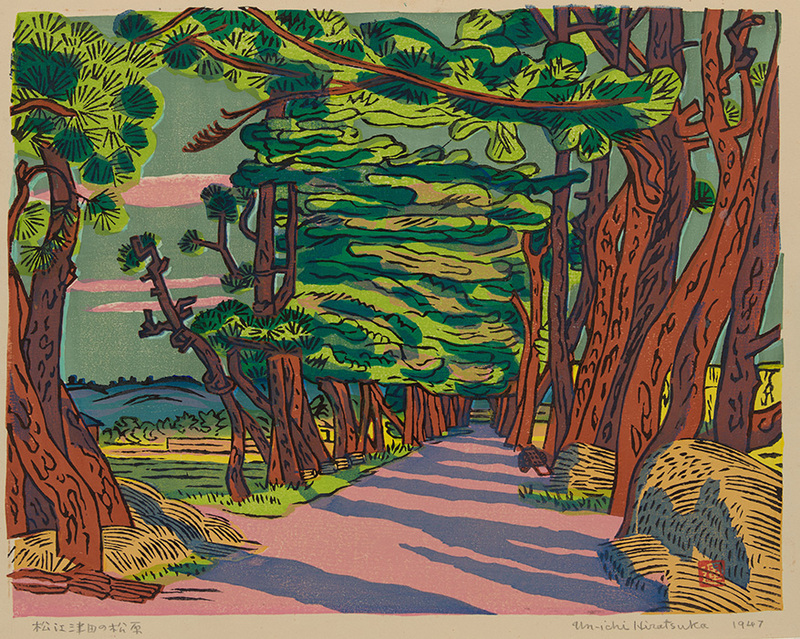 In this print, sunrays and dappled green leaves on an avenue make palpable Hiratsuka’s appreciation of his birthplace, its regional history, and the greater natural world. It is perhaps not entirely free of nostalgia. Matsue, a quiet town on the country’s northwestern coast, was once a lively center of trade with Korea and China. The nearby town of Izumo hosts one of Japan’s oldest and most admired Shinto shrines, built from unpainted wood. Hiratsuka’s affinity for wood started at a young age: his grandfather was an architect and his father a lumber dealer. Through his work, Hiratsuka honors the Shinto principle of spirituality in nature, which is evident in the earthy appeal of Matsue Birthplace.